My all time personal favourite! Many thanks! Yup. this is definately the funniest so far. 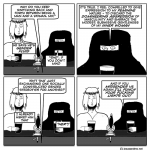 Jesus and Mo at the bar: pissed up, massive religious symbols and cocking about lashed – how good can it get? I suppose Malteasers are out of the question too? Cashews and walnuts would prolly be OK, though. No malteasers? Noooooooo! I’d rather die! Sounds strangely like some one else ive heard of.